An excel­lent overview of the evo­lu­tion of aero­space pow­er in India and the way ahead. The writer high­lights the fact that the com­bat poten­tial of the com­bat fleet of the IAF has been declin­ing over the last decade is not a close­ly guard­ed secret. With the MiG-23 fleet and sev­er­al squadrons of MiG-21 pro­cured in the six­ties / sev­en­ties phased out and the LCA Tejas not yet oper­a­tional, there has been con­sid­er­able ero­sion of com­bat poten­tial. Even with the induc­tion of sev­en squadrons of the Su-30M­KI so far, the strength of fight­er squadrons in the IAF stands at 33.5 against the autho­rised 39.5. As per the Min­istry of Defence (MoD), the remain­ing nine squadrons of the acci­dent-prone MiG-21 fleet would be phased out by 2017. By then, the IAF hopes to receive anoth­er eight squadrons of the Su-30M­KI. If no oth­er com­bat air­craft is induct­ed, by the end of 2017, the IAF will have a fleet of only 32.5 com­bat squadrons. He con­cludes grim­ly that the effort at the con­tem­plat­ed trans­for­ma­tion of the IAF into a mod­ern aero­space pow­er in a prac­ti­cal time frame, will face chal­lenges from the con­trol­ling politi­co-bureau­crat­ic sys­tems that are per­haps as daunt­ing as those from the ene­my. 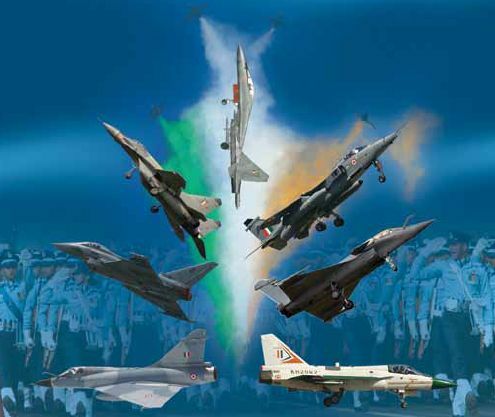 Estab­lished on Octo­ber 8, 1932, the Indi­an Air Force (IAF) has now entered its eight­i­eth year of exis­tence. Dur­ing its glo­ri­ous his­to­ry, the com­bat ele­ments of the IAF under­went bap­tism by fire in the 1930s oper­at­ing against rebel forces on the North West Fron­tier and lat­er in Bur­ma dur­ing World War II. Their met­tle was again test­ed against fierce oppo­si­tion by Pak­istan Air Force in the wars in the sub-con­ti­nent in 1965 and 1971. The com­bat fleet went into action once again in Kargil in 1999 albeit with­out aer­i­al oppo­si­tion. Each time the spear­head of the nation’s air pow­er exert­ed a deci­sive influ­ence on the out­come of the con­flict. Since inde­pen­dence, the trans­port and heli­copter fleets of the IAF have been ren­der­ing yeomen ser­vice sup­port­ing the for­ward deploy­ment of the ground forces along the inhos­pitable north­ern and north-east­ern fron­tiers. How­ev­er, on four occa­sions, the trans­port fleet of the IAF has been employed aggres­sive­ly, each time play­ing a cru­cial role in fur­ther­ing nation­al secu­ri­ty inter­ests. The first was the dar­ing mis­sion on Octo­ber 27, 1947 to land three Dako­ta air­craft at Sri­na­gar air­field with troops to pre­vent it from falling into the hands of the Pak­istan-spon­sored invaders. With Sri­na­gar air­field secured, rein­force­ments were induct­ed speed­i­ly by air and the Val­ley was thus saved. On Decem­ber 11, 1971, 36 trans­port air­craft of the IAF car­ried out an air­borne assault oper­a­tion behind ene­my lines in the then East Pak­istan. The 700 para­troop­ers dropped behind ene­my lines at Tan­gail, cut off retreat of the Pak­istani forces has­ten­ing col­lapse of Dac­ca, bring­ing to an end the war in the east. In the last week of July 1987 the IAF air­lift­ed a 10,000-strong mil­i­tary con­tin­gent from Hyder­abad to Jaffna as the lead ele­ment of the 80,000-strong Indi­an Peace Keep­ing Force (IPKF) in accor­dance with the his­toric Indo-Sri Lan­ka Accord. The IAF trans­port fleet remained the life­line for the IPKF through­out their deploy­ment in Sri Lan­ka. IAF heli­copters were used exten­sive­ly for logis­tic sup­port, recon­nais­sance, com­mu­ni­ca­tion duties and offen­sive mis­sions. But the most dra­mat­ic mil­i­tary inter­ven­tion at long range by the IAF was in the Mal­dives on the night of Novem­ber 3, 1988. The oper­a­tion was under­tak­en in response to a request from the gov­ern­ment of the Mal­dives for urgent mil­i­tary assis­tance to counter exter­nal­ly spon­sored inva­sion. Two IL-76 air­craft with 400 Para Com­man­dos flew direct­ly from their base in Agra to Hul­ule air­port in the Mal­dives 2,000 km from the Indi­an penin­su­la. The swift mil­i­tary inter­ven­tion in a dis­tant land was pos­si­ble only through long range strate­gic air­lift air­craft. The nation can derive sat­is­fac­tion from the fact that the IAF lived up to expec­ta­tions each time it was called into action. How­ev­er, the IAF must now pre­pare for the chal­lenges loom­ing over the hori­zon. Speak­ing on the occa­sion of the IAF anniver­sary in Octo­ber 2010, Air Chief Mar­shal P V Naik, the then Chief of the Air Staff described the pre­vail­ing secu­ri­ty sce­nario in India’s neigh­bour­hood as “a vol­cano that may erupt any­time”. He went on to say that “oper­a­tional pre­pared­ness was the key to meet the com­plex threat with swift response, flex­i­bil­i­ty and pre­ci­sion”. As per the Air Chief, the IAF was in the process of trans­for­ma­tion into a potent aero­space pow­er by 2017. The state­ment of the CAS suc­cinct­ly drew atten­tion to the chal­lenges that lay ahead for the IAF. The tra­di­tion­al foe Pak­istan although on the verge of being a “failed State”, ought not to be under­es­ti­mat­ed as it con­tin­ues to receive potent com­bat air­craft from the US and in larg­er num­bers from Chi­na. The Peo­ples Lib­er­a­tion Army Air Force (PLAAF) on the oth­er hand is rapid­ly evolv­ing from an anti­quat­ed force to a mod­ern aero­space pow­er. Its com­bat fleet has the cloned ver­sions of the lat­est Russ­ian fight­ers and has even test flown its indige­nous fifth gen­er­a­tion fight­er. In terms of num­bers, the PLAAF is three times the size of the IAF. India can­not afford to ignore China’s rise as a mil­i­tary and eco­nom­ic giant on the glob­al are­na. India is also emerg­ing as a region­al eco­nom­ic and mil­i­tary pow­er and its secu­ri­ty inter­ests now tran­scend its bor­ders extend­ing from the Mid­dle East to South East Asia. As a region­al pow­er, India will be expect­ed to play a crit­i­cal role towards region­al secu­ri­ty and sta­bil­i­ty. Such a respon­si­bil­i­ty will require the nation to pos­sess the capa­bil­i­ty of pow­er pro­jec­tion. India there­fore needs not only a potent com­bat force but also the means to trans­port swift­ly and deploy com­bat pow­er over long dis­tances with­in and beyond nation­al bound­aries. India’s capa­bil­i­ty to play a mean­ing­ful role as a region­al pow­er, will there­fore hinge to a large extent on a pow­er­ful and bal­anced Air Force. How­ev­er, what needs to be eval­u­at­ed is the state of oper­a­tional pre­pared­ness of the IAF today and as to whether the “process of trans­for­ma­tion into a potent aero­space pow­er” as pur­port­ed by the CAS, is actu­al­ly on sched­ule. The fact that com­bat poten­tial of the com­bat fleet of the IAF has been declin­ing over the last decade is not a close­ly guard­ed secret. With the MiG-23 fleet and sev­er­al squadrons of MiG-21 pro­cured in the six­ties / sev­en­ties phased out and the LCA Tejas not yet oper­a­tional, there has been con­sid­er­able ero­sion of com­bat poten­tial. Even with the induc­tion of sev­en squadrons of the Su-30M­KI so far, the strength of fight­er squadrons in the IAF stands at 33.5 against the autho­rised 39.5. As per the Min­istry of Defence (MoD), the remain­ing nine squadrons of the acci­dent-prone MiG-21 fleet would be phased out by 2017. By then, the IAF hopes to receive anoth­er eight squadrons of the Su-30M­KI. If no oth­er com­bat air­craft is induct­ed, by the end of 2017, the IAF will have a fleet of only 32.5 com­bat squadrons. The IAF is bank­ing on the induc­tion of six squadrons of the Medi­um Mul­ti-Role Com­bat Air­craft with which the tal­ly will go up to 38.5 squadrons, still short of the cur­rent­ly autho­rised lev­el. Besides, the MoD intends to enhance the num­ber of com­bat squadrons to 42 by the end of the decade, a fig­ure close to an ear­li­er assess­ment of 45 squadrons to fight a full-scale war on one front and hold­ing action on the oth­er. How­ev­er, in case the nation is embroiled in a full-scale two-front war against Chi­na and Pak­istan simul­ta­ne­ous­ly, it will need a 60-squadron Air Force. How­ev­er, the imme­di­ate short­fall of 3.5 squadrons can be made up with the LCA Tejas pro­vid­ed it receives Final Oper­a­tional Clear­ance and the IAF dou­bles the order for 40 air­craft already placed. Alter­na­tive­ly, there is talk of enhanc­ing the order for MMRCA by 63 air­craft (three squadrons). Besides, HAL has entered into a joint ven­ture with Unit­ed Air­craft Cor­po­ra­tion of Rus­sia to pro­duce a cus­tomised twin-seat ver­sion of the Russ­ian T-50 PAK FA. Referred to as the Fifth Gen­er­a­tion Fight­er Air­craft (FGFA), the IAF is expect­ed to get around 250 (14 squadrons) with induc­tion begin­ning in 2017. This fleet will in due course replace the 17.5 squadrons of third gen­er­a­tion air­craft that have been in ser­vice with the IAF for over 25 years. These include the MiG-27, MiG-29, Jaguar and the Mirage 2000. With midlife upgrade at phe­nom­e­nal cost under­way, these air­craft may con­tin­ue in ser­vice up to 2025. Beyond this date, the com­bat fleet of the IAF will com­prise the upgrad­ed Su-30M­KI, the MMRCA, the FGFA and the Tejas MkII.